Want to get customers' attention? Check out Promotion Pros' custom noisemakers. 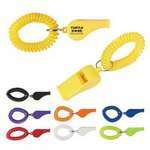 We are stocked with whistles and other noisemakers in a variety of colors and styles, so no matter what you're searching for, you'll find something that suits your needs. Our personalized noisemakers will represent your company for long-term brand recognition. With styles ranging from whistles with coil to whistle with light and compass keychain, our custom noisemakers use color and your company name and logo to promote your business. Our Cowbells features seven beautiful color options and allows adding brand logo and message to create nice Custom Giveaways. Let your brand’s value be heard loud and clear above your competitors with the Whistle with Coil. Prepare your customers for any eventuality! Call for help immediately or bring order to a chaotic situation using this essential promo item. Add a safety feature, to the everyday essentials you carry, with the whistle, light and compass key chain. 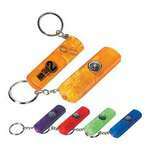 Imprint on the three-in-one key chain and build customer trust in your company’s brand.